●West Nippon Expressway (Search Route and Price) The nearest IC is Nanki-Tanabe IC. Take the limited express from Shin-Osaka station or Kyoto station and get off at Kii-Tanabe station. It is convenient if you use the taxi from the station. Drive down Kinki Expressway and Hanwa Expressway from Suita JC on Meishin Expressway, and get off the highway at Nanki-Tanabe IC. It takes about two hours and twenty minutes from Suita. 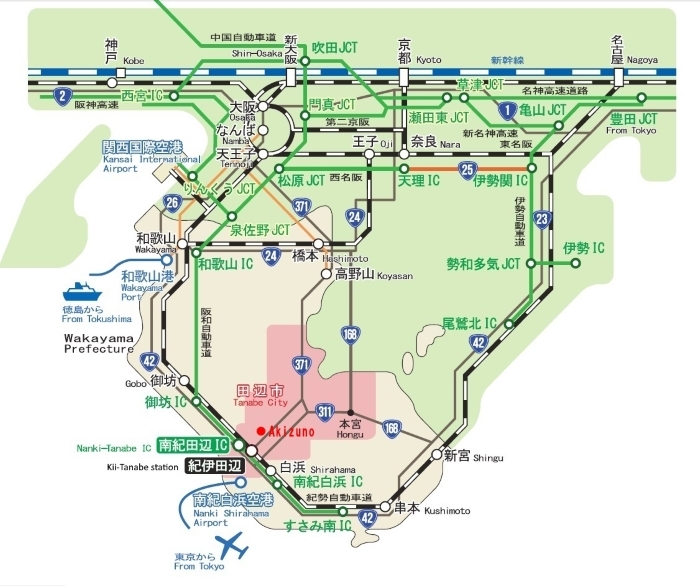 Drive down Daini Keihan Road, Kadoma JC on Kinki Road, and Hanwa Expressway from Kyoto-Minami IC on Meishin Expressway, and get off the highway at Nanki-Tanabe IC. It takes about two hours and twenty minutes. Nanki-Tanabe IC on Hanwa Expressway connects to national highway 42 Tanabe bypass. Take second exit to get in prefectural route 29, and turn left at the traffic light toward Ryujin and Koya-san. Go along the road and you’ll see the signboard of Kitera. Follow the direction. It takes about 7 to 8 minutes from Nanki-Tanabe IC to Kitera. get off Nanki-Tanabe IC and go along the road which is national highway 42. Make sure to get off the second ramp. Many people make a mistake to get off the first ramp. This information board is a landmark.